There's such a thing as mandated rent reduction in Toronto? Who knew?! Along with a lovely holiday cheer card from a good friend (hi, Sameer! ), my mail arrived today with an early Christmas present from the City of Toronto Shelter, Support and Housing Administration Division. I received notice that my rent is being reduced, effective December 31st, 2009, by 0.53%. Being the first time it's happened to me, I'm curious how common this is. How and why and when does this happen? Did many renters get these notices? 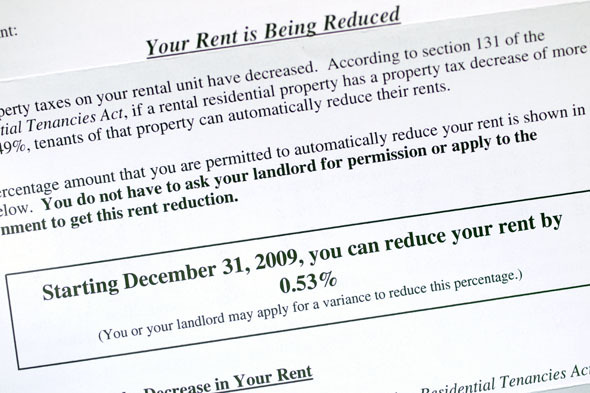 According to the accompanying paperwork in the rent reduction notice, when annual property taxes on rental properties goes down more than 2.49%, tenants are entitled to a rent reduction. In my case, (and after a fairly simple calculation) this reduction amounts to 0.53% off my monthly rent, which is not much to dance around naked about. It does amount to the approximate cost of an indoor parking space for one month of the year, and it sure beats a rent increase. Apparently I'm one of over 128,000 Toronto tenants that are on the mailing list for rent reduction this year. To you all, I raise a glass and say... cheers! To the remaining majority, whose properties taxes increased this year... my sympathies to you. Hopefully your rent doesn't go up as a result.